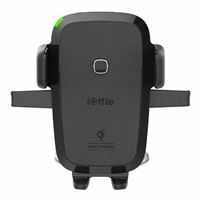 The Easy One Touch 4 Qi Wireless Fast Charging Mount from iOttie combines the power of Qi wireless fast-charging with the agility and convenience of iOttie's patented Easy One Touch mounting system. The mount's base employs powerful suction force and a reliable sticky gel to attach securely to either the dash or windshield of your vehicle. Its telescopic arm extends between 4.9 and 8.3" and can pivot 225 degrees, which allows you to position your smartphone right where you need it. In addition to providing a convenient, hands-free mounting solution, the Easy One Touch 4 also delivers a powerful method for charging your device. Thanks to integrated wireless Qi-charging technology, you can place any Qi-compatible phone in the mount and it will automatically begin to charge at speeds up to 40% faster than standard wireless charging. 8.1" x 5.2" x 3.6"